Jahan Azizi, a national expert on instrument sterilization, discusses the difficulty of cleaning surgical instruments. The Detroit Medical Center has had problems with dirty surgical instruments for more than 10 years, but the issue remained hidden in part because the public can’t access most records about health care. The Detroit News on Thursday published an investigation showing that doctors have complained for years that improperly cleaned, broken and missing instruments have complicated and canceled dozens of operations at the system’s five-hospital Midtown campus. The report was based on 200 pages of emails and internal reports that aren’t public and were cloaked in secrecy by Michigan law. State and federal agencies collect a substantial amount of data, but allow hospitals to supply it voluntarily on the condition that much of it is kept confidential. That means only the broadest information — typically about regional rates or whether hospitals are above or below averages — is available to the public. And Michigan has some of the more restrictive privacy laws in the nation, making it harder for consumers to research hospitals and learn specific information about hospital-acquired conditions such as surgical site infection rates, the prevalence of C-sections and rates of mishaps. “There is a culture of secrecy,” said Jahan Azizi, a retired clinical engineer for risk management at University of Michigan Health System and nationwide expert on instrument cleaning. Nationwide, 721,800 patients acquire infections at hospitals, causing 75,000 deaths per year, according to the Centers for Disease Control and Prevention. Hospital-acquired conditions cause or contribute to 99,000 annual deaths, more than AIDS, breast cancer and car crashes combined, according to the CDC. A recent Johns Hopkins University study found that, all told, medical errors may cause 250,000 deaths per year, which would make it the third largest cause of death in the United States, behind heart disease and cancer. The U.S. Food and Drug Administration tracks complaints about specific medical instruments, for instance, but it keeps private which hospitals reported them. 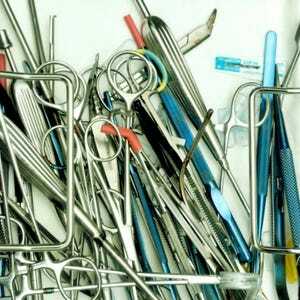 “Obviously, a lot of those patient deaths are caused by improperly cleaned/reprocessed surgical instruments,” said Jim Schneiter, a nationwide expert on instrument cleaning and owner of America’s MedSource, an Illinois-based medical supplier. The federal government’s Centers for Medicare & Medicaid Services collects vast amounts of data from hospitals on quality measures such as surgical site infections. Reporting is voluntary, but hospitals must comply to receive Medicare payments. That means hospitals serving children — whose patients don’t qualify for Medicare — don’t have to report any data. Available information also may be skewed. A 2012 study by the U.S. Department of Health and Human Services found that healthcare staffers didn’t report 86 percent of adverse events, partly because of misconceptions about what causes harm. Also, public information about hospitals that receive Medicare only show if they are above or below average on specific categories: Only 10 percent are below average, according to The Leapfrog Group, a Washington D.C.-based nonprofit that publishes hospital quality data and advocates for more public information. Laura Wotruba, public affairs director of the Michigan Health and Hospital Association, said releasing data can be problematic and tough for consumers to decipher. So-called “safety net” hospitals that treat low-income, older and more vulnerable populations can often have higher infection rates. Statistics also vary depending on how data are collected and processed, she contended. Her group’s Keystone Center, which researches patient safety, conducts annual audits of Michigan hospitals. Its annual report includes details about how hospitals performed as a group on specific trends — such as deaths from septic shock — but details about individual hospitals are not included. Advocates said the healthcare industry relies on privacy in hopes of fostering open dialogues to improve care — sometimes at the expense of consumers. “It’s really hard to find out who’s good and who’s not,” said Dave deBronkart, a Massachusetts-based cancer survivor who is an author, public speaker and national advocate for increased transparency. By design, healthcare is self-policing and relies on doctors’ consciences, said Frank Mafrice, a Southfield malpractice attorney. Internal committees meet regularly to review mishaps and deaths and mete out discipline. By law, the proceedings are private to foster frank discussions without the fear of lawsuits, Mafrice said. In many cases, it’s easier for the public to research restaurants than hospitals, said Erica Mobley, director of communications for The Leapfrog Group. Complaints about hospitals aren’t public until they’re investigated by the state and result in a formal plan to fix problems, a process that can take months. Complaints about doctors are private until they’re disciplined or fined by the state Department of Licensing and Regulatory Affairs. The Centers for Medicare & Medicaid Services collects data on infections and complications and shares it with state governments. CMS rates hospitals on a 10-point scale based on their performance in reducing hospital-acquired conditions such as infections. The higher the number, the worse the performance, with facilities receiving a 6.75 or higher losing 1 percent of their Medicare funding. Some states share the raw data used to compile the rankings. 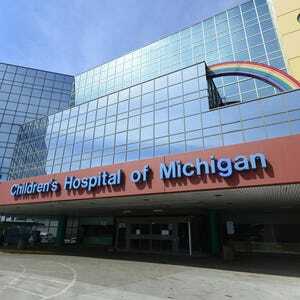 In Michigan, the information is used to produce reports about infection trends but the names of hospitals — and even their locations — are kept private. Only researchers have access to the information, which is used to monitor outbreaks, said Jennifer Eisner, a spokeswoman for the state Department of Health and Human Services. Fear of lawsuits has prompted healthcare to err on the side of privacy, said deBronkart and Mobley. There’s no legal requirement in Michigan that doctors inform patients of mistakes, but doing so has worked wonders for the University of Michigan Health System, said Mafrice. Ten years ago, the Ann Arbor-based system encouraged doctors to voluntarily disclose their mistakes to patients and apologize. 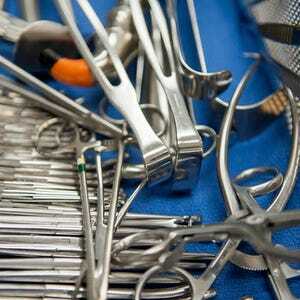 Malpractice claims and lawsuits declined dramatically. And ethically, doctors should report mistakes even if they don’t cause injury, said Dr. Ed Goldman, a professor of medicine and law at the University of Michigan. “Transparency is almost always the right thing to do,” he said. Hospital Compare:Website operated by Medicare.gov. » Pros: Allows users to compare up to three hospitals on a host of categories such as outcomes of hip and knee surgery; patient satisfaction; infections; use of medical imaging and the cost of care. » Cons: Specific rates aren’t often available and the system instead lists whether hospitals are above or below national averages. The information is voluntarily reported by hospitals that receive Medicare. That means children’s hospitals aren’t included. The Leapfrog Group: Nonprofit that collects a host of information on all hospitals and posts on its website, leapfroggroup.org. » Pros: Users also can find basic information about hospitals, and compare as many as three of them on a range of categories, from intensive care training and prevalence of C-sections to lengths of stay for acute conditions. » Cons: Entirely voluntary. Some hospitals don’t respond. Categories are displayed in 4-point rankings, rather than actual data. U.S. News & World Report: Website offers rankings of hospitals in 16 adult specialties from cancer to radiology. Go to: health.usnews.com/best-hospitals. » Pros: User friendly. Allows users to learn which hospitals have best reputations for specific care in their area. » Cons: Subjective. Listings are based on surveys of doctors and publicly available information that is limited in nature.